In 195 B.C., the leading women of the Roman Republic were fed up. They revolted. According to Livy, the Roman historian, the matrons blocked all the streets to the Forum, begging the men as they came down to the Forum that, in the prosperous condition of the State, when the private fortunes of all men were daily increasing, they should allow the women to have their fair share too. The consul at that time, the famous Cato, reacted as could be expected. In a flamboyant speech he argued that, “the liberty of men, already destroyed at home by female violence, was now crushed and trodden underfoot in the Forum.” “What sort of practice is this”, he exclaimed, “of running out into the streets and blocking the roads and speaking to other women’s husbands?” “If the women win in this, what will they not attempt?” “The moment the women begin to be your equals”, he warned his fellow-citizens, “they will be your superiors.” But in spite of his stern warnings, the matrons of Rome won. They were granted the right to wear jewelry as they pleased, ride in carriages, be borne through the city, gaining a public freedom which no Greek woman had ever enjoyed. This remarkable feat took place at a time when the Roman Republic was at its zenith as the sole superpower in the Mediterranean. In 202 B.C. it had defeated its main rival, Carthage, and the spoils poured in. The matrons had organized their ‘Occupy-the-Forum’ protest to demand the repeal of a twenty-year old law, the Oppian law. The Tribune Gaius Oppius had carried this law in the heat of the war with Carthage, stipulating that no woman should possess more than half an ounce of gold or wear a purple-trimmed garment or ride in a carriage in the city. The goal had been to secure enough private resources in order to finance the war effort and wealthy families proudly displayed on their tombs their personal and financial sacrifices, as tokens of their commitment to the Republic. The rebellious women belonged to the class of the super-rich, less than one percent of the Republic, and their rebellion mirrored the two sides of the same coin. In Asia, Greece, Spain and Africa their men were regarded as the new masters of the world, and as their spouses they wanted to be treated in the same fashion at the home front in Rome and Italy. But by doing so, they also became one of the driving forces behind an unprecedented rat-race between the large families and the creation of new sharp divisions within the leading circles as well as between the different classes of the Republic as a whole. With the influx of slaves and allies from all the surrounding countries, the Republic became increasingly Mediterranean and while launching a cultural war against the influence of the Greek culture and moral decline, the leading circles started destroying what had been the essential ingredient of the success of the Republic: the policy of sharing which had lasted for four hundred years. The Oppian Law was one of the first laws to go and was a sign of the break-down of the old order, and in the following decades a policy of de-regulation, repeal and naked abuse would become the dominant force. For the leading circles the Republic had become a means to self-enrichment. To protect the interests of the veterans, by law no one was allowed to own more than a certain amount of public land, but land-grabs had driven out many small farmers, destroying the very basis of the Roman army as a military force of free men. Wheat fields were converted into pastures for the more profitable production of meat and leather, increasing the dependence on imports of wheat from Sicily and later on from Egypt. The Tributum, a kind of income tax to finance the build-up of warships, was abolished, allowing pirates to dominate in the Mediterranean. Senators participated in private “consortia” which were founded to secure the lending to city-states in Greece at usurious interest rates. At the same time the co-owners of the consortia were appointed as local governors, so they could use the Roman army if the cities were unable to meet their obligations, while the Senators could block any litigation as the sole members of the juries. Earlier on, Roman commanders had robbed the Greeks of their works of art, now they stole their bread. Consuls in their final months of office received donations from friendly candidates to influence the elections in exchange for a position as pro-consul in the most lucrative provinces. The costs of the election campaigns rose to unprecedented levels with lavish banquets, free distribution of meat and bread, gifts, bribes and spectacular gladiatorial shows. Priests were bribed to see good fortune in offerings that never took place. Permission to hold a triumphal march was bought from tribunes in exchange for a higher share of the loot for the soldiers. Custom-officers were bribed to avoid the taxes on the import of luxury goods. Litigation became the new national sport. Inheritances, dowries, purchases, adoptions, all were contested in court. Lawyers plucked bums from the streets and paid them to cheer in court as they spoke and the backlog of cases forced judges to limit the speaking-time with water-clocks. Merchants who had won tenders to sell slaves on behalf of the state, placed signs on the heads of the slaves, warning potential buyers that they could not guarantee their condition and that they did not accept any personal liability if the ‘purchase’ proved to be in bad health. Veterans who returned home after 16 years of military duty were exploited by their former commanders as seasonal workers and when the job was done, they were left on their own, often in worse conditions than the slaves, as the latter represented an investment, while the veterans were just an incidental cost. 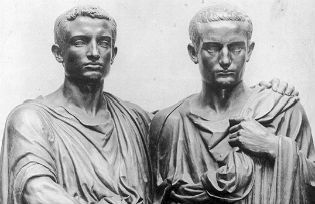 To save the Republic, two brothers, the Gracchi, attempted to change the course through a number of legislative programs. Although plebeian by birth, in their veins ran the bluest of blue blood. Their grandfather had been Publius Cornelius Scipio Africanus, the man who had defeated Hannibal and Carthage. Their father, Tiberius Sempronius Gracchus senior, had been consul twice. Their mother, Cornelia, was one of the most influential women of the Republic. Cicero and others still praised her letters a hundred years later and everyone mentioned her role in the upbringing and education of her sons. Once elected, he encountered intense opposition and obstructionism, comparable to the current presidential campaign in the US, full of hatred and vitriol. Starting with smear campaigns and character assassination, Tiberius’s enemies obstructed his access to public money, committed voting fraud, and finally succeeded in getting a fellow tribune to veto his legislation. Faced with this opposition, growing unrest in Rome, and slave uprisings in the South, Tiberius felt compelled to have his fellow tribune voted out of office by the People’s Assembly- an unprecedented act – and to appropriate public money from a donation made by the King of Pergamum. After he announced his intention to run as tribune for a second year, a group of senators, led by his cousin, descended from the Capitol, and using pieces of furniture, sticks and stones, they clubbed Tiberius to death along with many of his followers. Eleven years later, his younger brother, Gaius, launched a more comprehensive program to restore law and order. He tried to create a clear division between legislative and judicial powers, to curtail the executive branch, and to reform the state finances as well as the grain- and land programs. He initiated the construction of the first Roman ‘highway’ in an attempt to create new jobs and to speed up the transport of wheat to the city. His programs ultimately led to a coup d’état of the consul, and to mass atrocities in which three thousand Roman citizens were killed. The assassination of the Gracchi and the fragmentation of the Republic into warring factions resulted in a civil war, which lasted a hundred years and ultimately in the destruction of the Republic. The Roman Republic was a very different society than ours, but it resembled perhaps more than anything else the current state of affairs in the People’s Republic of China, with its competing families and princelings, patron-client type of dependencies, illegal land-grabs, the lack of any kind of judicial independence, weak institutions, the moral breakdown of the communistic ideology and a frantic focus on the accumulation of personal wealth within leading circles. But the fate of the Roman Republic also seems to hold a lesson for all of us, wherever we live: if the leading circles in a society are no longer willing to share and to maintain the rule of law, then that society will eventually implode as we witness today throughout North-Africa and the Middle-East. As this enfolds, we can be sure that the men and women at the top will defend their privileged positions by presenting themselves as the true guardians of the rule of law, and that, even more stunningly, they will able to elicit support from those who suffer the most, thus accelerating the fall of all. 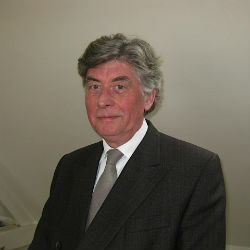 Joost Douma has studied philosophy and economic history. In his early career, he served the city of Amsterdam as chairman of urban renewal programs. He later founded the first Dutch national science center, NEMO. He is currently working on his second novel, next to his activities in the field of sustainability.